Leon Camier has taken his third BSB win at Silverstone while team-mate Shane Byrne finished third to become BSB champion, without passing a single rider! Byrne and Camier didn't get a good start and at the end of the first lap were eighth and ninth respectively, with Haslam, Crutchlow and Sykes pulling away at the front. 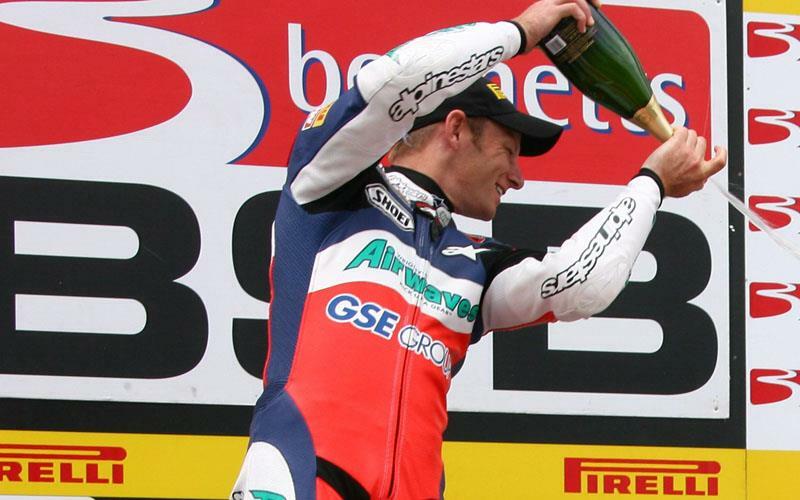 It was looking like Shakey would struggle to get on the podium un til lap three when Tom Sykes took out Leon Haslam at the final chicane in a desperate lunge, mirroring Haslam's move at Oulton Park. This pushed Shakey up to sixth. Sykes' manager Jack Valentine was called to race control for the incident to be reviewed. Disciplinary action may be taken. Then two laps later James Ellison crashed braking in to the final chicane and clipped the back of Michael Laverty. This allowed Shakey to move up another two places to third, where he was able to open up a huge gap from fourth place man Michael Rutter. Crutchlow was leading from Camier until lap nine. Byrne sat comfortably in third place to win the championship. On lap 17 Karl Harris retired due to what is thought to be a mechanical problem. Leon Haslam and Tom Sykes finished 12th and 13th respectively.